Welcome back for part twelve of my weekly blog posts on my journey to becoming a personal trainer. Today I'm going to talk about Week Ten and how it's been going. Week 10, the last module, was the final exam for the program. This was the one I had one chance to pass with at least an 80% in order to get my certification exam retake voucher and as you can see I passed it with a great grade! I did a lot of studying and several retakes of the two practice exams before attempting it and I feel like I knew the material really well but it was still a relief to pass with a really good grade. I hope this is symbolic of the certification exam still to come but from all the reading and research (and YouTube video watching about the exam) that I've done I have a feeling the certification exam will be a lot harder and a lot trickier than this final was. Once I passed the final, the real studying began. 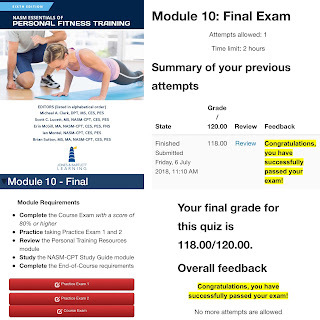 I signed up and paid for some extra practice exams through the Fitness Mentor's Website (where I also got one of the study guides that I used) because I'd rather pay a extra money now and have a better chance of passing my certification exam and a better way of being prepared, than to fail and have to retake it all again. The problem that I'm finding with these practice quizzes (I haven't actually done those exams yet, just most of the quizzes so far) is that the questions are different and appear to be a lot harder than the questions on the NASM site but, like I said, this gives me another way of studying and like I've also said all throughout this program, I'd rather be over prepared than under prepared. 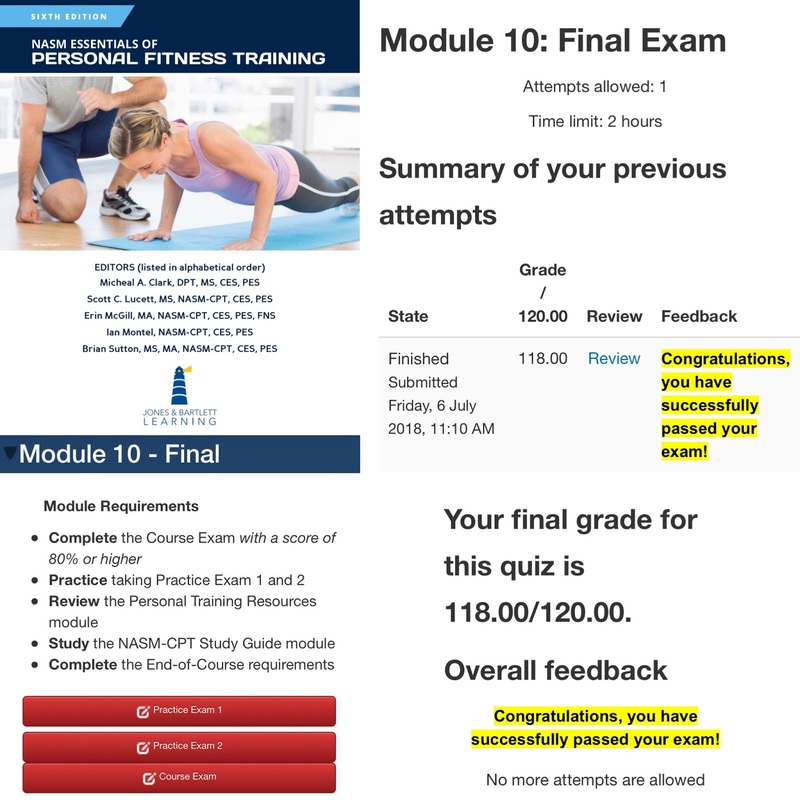 I've also started working on the "NASM-CPT Study Guide" Module and, honestly, the study exam in the module was the hardest test I've take so far. It was actually a lot harder than the final exam was and it really showed me the areas I needed to focus on with my studying! I can honestly say that I'm feeling like I'm retaining the information a lot better and I'm currently spending the majority of my days studying, taking quizzes and tests, watching YouTube videos on the info that I still need help on (like the functions of the heart), taking even more quizzes and tests on the apps I have, and studying some more. I have a feeling that this will pretty much be my life until the exam on August 2nd. I feel like I know I lot but at the same time there is still so much I need to learn and memorize that some days I feel confident and some days I feel like I'm drowning so, I don't know. I kind of wish I'd signed up for an earlier exam just to get it over with but at the same time, I like having a couple of extra weeks to allow me to really learn and information and memorize the parts I'm still iffy on. I changed my CPT exam to July 26th instead of August 2nd. I want to take it while the knowledge is fresh in my head so I now have 11 days until I have to take it but I feel good about that timeframe.